In response to a reader comment regarding a previous post, I’m doing connected blogs. There’s more about white wedding dresses at Two Nerdy History Girls. This is an 1831 white wedding dress, one of several examples I've found of white wedding dresses before Queen Victoria wore white at her wedding (10 February 1840). A dress of blonde de Chantilly, over white satin; the corsage of the lace dress, cut low and square round the bosom, is ornamented with a lappel which forms points upon the shoulders ; the points falling over a single row of superb blond lace, which covers the short béret sleeve of the white satin under-dress. Two very deep flounces, so arranged that one falls a little over the other, reach from the bottom of the skirt considerably above the knee, and are surmounted by a very rich embroidery. The wedding veil, also of blonde de Chantilly, is arranged in the drapery style at the back of the head, and the corners, brought round the base of the bows of hair on the summit of the head, are attached by a nuptial garland of orange flowers. A bandeau of emeralds set in gold goes round the forehead; earrings, necklace, and bracelets to correspond. In Inspiration Tags history, fashion, "The Mad Earl's Bride"
Let’s face it. My brain simply isn’t big enough to finish writing a book, blog every other day or so at Two Nerdy History Girls and blog here, too. Now, though, I’ve sent off the copyedited manuscript (more about that later)—and the experience may well provide blog fodder. That leaves me in the stage of staring into space, wondering what the next book will be about. 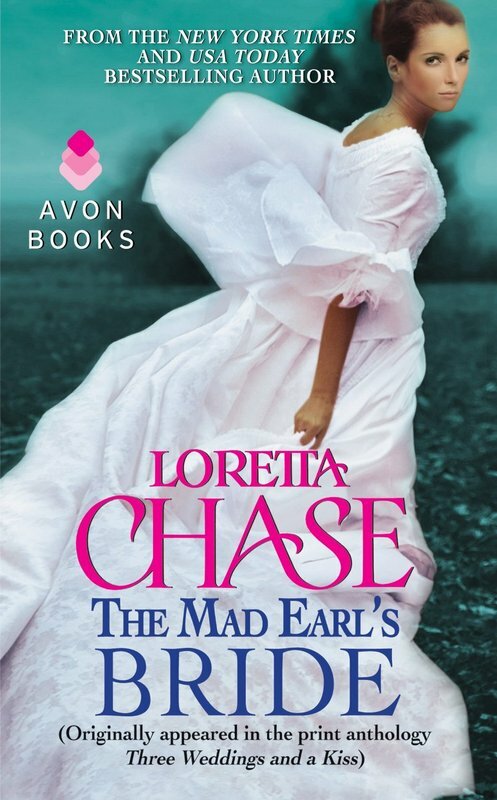 Once upon a time, between Lord of Scoundrels and The Last Hellion, I wrote a novella, “The Mad Earl’s Bride,” for an anthology titled Three Weddings and a Kiss. Avon has reissued “The Mad Earl’s Bride” along with works by Catherine Anderson and Samantha James, in a handsome new volume titled Three Times a Bride, which will be out in May. You can learn more about early 19th century weddings and dresses here. The wedding dress pictured below is from the 1829 Ackermann’s Repository, as is the description. A ROUND dress of Brussels lace over a slip of white gros de Tours ; the body of the slip is cut low and square ; the corsage of the dress is made up to the throat and fastens behind, it sets close to the shape round the upper part of the bust, but has a little fulness at the bottom of the waist. Long sleeve à l’Imbecille over the manche à la bêret of the slip. A biais of white lace, finished at the upper edge by a white satin rouleau, goes round the skirt, and is surmounted by an embroidery of uncommon depth and beauty. A Turkish pelisse of white satin is worn over the lace dress; it is open in front, and the corsage open before and behind falls over the bust in a deep fold, which is divided on the shoulder; a satin rouleau edges the front and corsage of the pelisse; the bottom of which has no other trimming than an ourlet of uncommon breadth. The hair is arranged in front in the Madona style, and disposed in full bows on the crown of the head. Head-dress, a garland of flowers (orange) and a Brussels lace veil; pearl necklace, from which is suspended a diamond cross; diamond earrings ; gold bracelets, à la Grecque, with diamond clasps ; white satin slippers laced in the sandal style; white kid gloves. In Inspiration Tags history, "The Last Hellion", "Lord of Scoundrels", "The Mad Earl's Bride"
Some years ago I wrote a novella, “The Mad Earl’s Bride,” for an anthology titled THREE WEDDINGS AND A KISS. The Big Name on the cover was Katheleen E. Woodiwiss, and the book rocketed to the top of all the bestseller lists. I’m not sure it ever went out of print, but whether it did or didn’t it’s decidedly in print now. Wench Susan/Miranda called me from a Borders bookstore to tell me it was being pushed to the front of the store. This month it’s part of their Buy 4 get 1 Free deal. All of which fits in nicely with today’s bridal theme. It seems like most of the heroines in historical romances are 18, 19, 20. There are some older, but usually those are referred to as being VERY old to be still looking for a husband and pretty much firmly "on the shelf". When my daughter was 18 or 19, I would have been very concerned about her getting married, thinking that she was not at all mature enough for taking that step. I know that a lot of marriages back in the Regency era (or whatever era the historical might be set in) were arranged by the families for reasons having nothing to do with personal selection (except in our favorite books, of course). But my question is were the young women back then that much more mature than girls today? Even if they had been trained to do all of the things to run a household, etc., that they were expected to do, would they have been emotionally ready for marriage? Or do authors give them the correct age for marrying at the time but write them with more maturity? Let me start by saying that my paternal grandmother was married by parental arrangement when she was fourteen years old. My maternal grandmother married for love (it was a shocking thing to do in Albania at that time) when she was sixteen. In those days, the bride went to live in the groom’s household where his mother ruled and her daughters-in-law did what they were told. This happened in the 20th century. Were my grandmothers more mature than today’s 16-year-old girl? Possibly. Or maybe not. Maybe they simply had less freedom and fewer choices. And maybe maturity depends on the girl. In my grandmothers’ time and place, girls didn’t have a lot of choices. They got married and had children. They would have been trained for marriage: how to run a household, cook & clean& sew & so forth--or (depending on socioeconomic class) supervise those who did. So they were better prepared for marriage than today’s average American sixteen-year-old. When creating women for my stories, I assume that, while manner and mores change, young women of two hundred years ago must have something in common with those of today. Some girls are mature and responsible at a young age. Then there are the ones like Lydia Bennett of PRIDE & PREJUDICE. It’s hard to imagine Lydia ever maturing, isn’t it? Look at her sisters Jane and Elizabeth. They’re in their early twenties, and far more mature than their mother. Mature or not, most women needed to marry, and the simple fact was and is, young women--generally speaking--are more attractive to men--generally speaking. Look at all those Gidget & Geezer movies. Look at all those Gidget & Geezer marriages in the land of millionaires and movie stars. Do the Geezers care if their Gidgets are mature? Women had then, as many do today, a real fear that past a certain magical age (past their “first bloom”), they would become unappealing or invisible to men. This is a truly worrisome prospect for some families, absolutely, in the Regency era. Think about Mrs. Bennett, frantic to get her daughters married ASAP. She had a genuine economic concern: When her husband died, she & her girls could be thrown out of their house, as was the case with the Dashwood women in SENSE AND SENSIBILITY. Think of the sorry plight of genteel but impoverished single women of this time. How do they support themselves? Mostly, they can’t. Mostly, they depend on others. Being “on the shelf” wasn’t simply rejection; it could be a financial catastrophe. In Judith Schneid Lewis’s IN THE FAMILY WAY: Childbearing in the British Aristocracy 1750-1860, I find ladies marrying from the age of 15 (Elizabeth, Lady Holland, b 1771) to 37 (Susan, Marchioness of Stafford, b 1731). Princess Charlotte, King George IV’s heir, married at age 20. Queen Victoria was 21. The majority were married between the ages of 18 and 20, but there are quite a few marrying in their early to mid-twenties. Anne Isabella Milbanke was 23 when she married Lord Byron. Mainly, though, as in the books Sharon refers to, upper class women were marrying at 18, 19, 20. And from what I’ve read, they were at about the same maturity level as young women of 18, 19, and 20 today. The difference is that they were expected to get married at that age and were trained to be wives and mothers as well as in the duties of the lady of the house. I’ve made my heroines various ages but tend toward older heroines--mid to late twenties, and one heroine (Mirabel of MISS WONDERFUL), thirty-one. This is mainly because I simply find them more interesting when they have some life experience. And that’s why, too, a number of my heroines are widows. Whatever their age, I’ve made them mature, though I try to show why they might be more so or more responsible than other girls of their social class and age. Being left motherless at a young age, being educated in an unusual way, having to fend for oneself, having to cope with a distant or psychologically troubled parent, etc.--these are all ways of giving a character maturity beyond her years. Gwendolyn Adams, the heroine of “The Mad Earl’s Bride,” is one such character. She needs to be levelheaded and mature, because the arranged marriage she agrees to is a very challenging one. Do you think young women were/are emotionally ready for marriage at 18, 19, 20? How do you feel about young heroines? Do you think young women 100-200 years ago were or weren’t like young women of today? Originally posted at Word Wenches. In Writing Tags history, "The Mad Earl's Bride"